Last summer I started to subscribe to the Lucky Dip Club. Every month I get a box of surprises, themed and full of little treasures. The really surprising part of this is the fact that month after month I give away almost all of the box! I mean this in the nicest possible way, but sometimes I just do not have a use for an ice cream tatoo…but Lil D does, oh boy she does. A seashell necklace with my initial on it? Not really my style, but Lil C shares that very initial- present time! A postcard telling us to seek adventure? Well I have a friend who is feeling a little stuck at the minute. Sharing the joy is the joy of this box. Oh and there are the necklace charms- a new one each month for me to try out. Not being a jewellery girl has transformed into my having new and interesting necklace every month. Though I’ve yet to find the occasion to suit the dinosaur charm…I’m sure it will happen someday. This month, the haul seems especially promising: 3 Christmas cards, a cute print, a pink planet brooch (that will soon be attached to my equally pink bag), a little pot of magic and a mirror. Guess what? I have recipients for them all in mind. Roll on December, I have people who need surprises. Lil D is a big fan of these two youtubers. For months now she has craved the jeopardy of not knowing whether the jelly bean she’s about to eat is lovely lime or lacklustre lawn clippings; perfect peach or vile vomit. She’s absolutely on her own in this desire. But with D Daddy’s birthday on the way, Lil D convinced her mummy that it would be an hilarious addition to the celebration. The parcel was delivered with giggles, perhaps tipping D Daddy off that something was on the way, but he didn’t flinch. Well not at that point. Lil GN stepped up to take part (but wisely backed down after a chorus of doom filled warnings) Lil C knew immediately that a pack of sweets that may taste like snot were not for her. Lil D looked round for more players (D Daddy had no choice)…and found Bear (who had spent the weekend before adamantly declaring she would only risk the blueberry/toothpaste option. Oh Bear, how naive you were. And so the fun began (there is video evidence somewhere). The first few seemed to go down surprisingly well. The audience hid their disappointment. Lil GN and Lil C began to think they could get involved. Then, it struck!! whether it was vomit or snot we will have to ask Bear, all we know is it was hilarious! The faces pulled got worse and worse. Yet, through it all, Lil C got the nice version of every sweet. I wonder if all that watching of Mo and Ro gave her some tips. December at last. Time to start the magic and mayhem with our very own liaison elf. 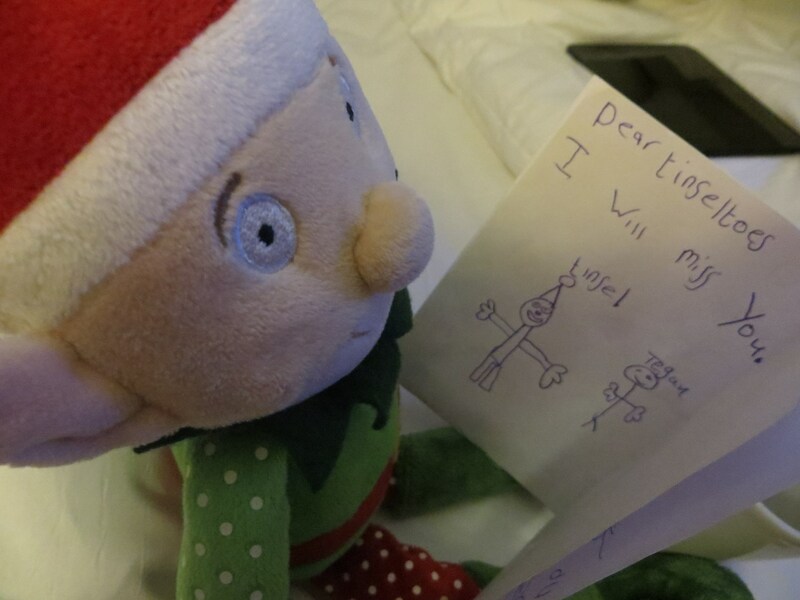 Last year Tinseltoes came direct from the North Pole to see if our dotes were being naughty or nice. Obviously the report must have been good cos he’s back again this year with more Christmas spirit. The dotes were amused (and baffled) last time by the cultural differences between elves and dotes. Tinsey was found each day in rather unusual places, having done all manner of odd things around the house. Particular favourites were drawing moustaches on our dotes photographs and having a tea party with Barbie and her friends. This year he surprised Lil D by turning up in the hotel where we stayed to see the Belfast Christmas Market. He was in the tub – much to her glee. He certainly had to come to dinner with us after that and was proudly given the seat of honour. Lil C then found him when she visited Nanny’s house and quietly went over to him and smiled – before charging into the living room to proclaim his triumphant return. Already he’s been found in the porridge – can’t wait to see what he does next!